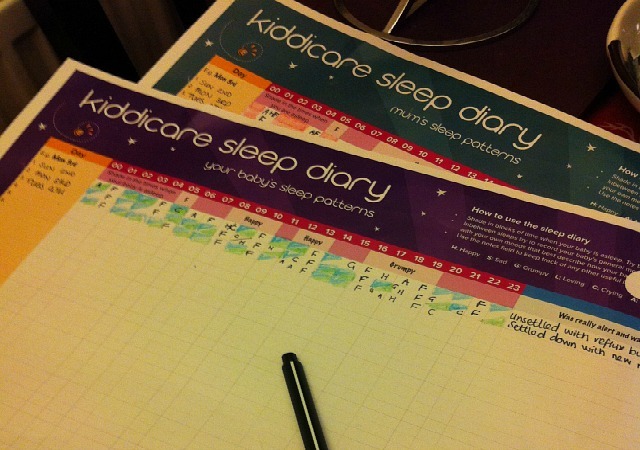 Earlier this month Kiddicare sent me a lovely little pack with some bits to get me started on keeping a Sleep Diary with my twins. As well as a diary for the babies and one for me there was a copy of Baby Sleeping Trust Techniques by Rebecca Welton. Even though the twins are my second babies there was so much I had forgotten about forging good sleep patterns and this book has given me a refresher with some great tips on babies sleep. The sleep deprivation hasn’t seemed as bad this time round but then I was expecting it (it was a BIG shock first time round) and I know there is light at the end of the tunnel! I’ve been completing the diaries now for just over two weeks and they have been very useful for keeping track of what happens over 24 hours and has helped me to see were I might be going wrong. One of the first things I noticed is that the twins had a few days were we had a very grumpy bath and bedtime. Looking at the hours before this they were awake for much longer than I thought and it was easy to see that they had become over-tired by the time we wanted to settle them for the evening. Looking through the book I found a helpful section about nap times for babies; how much is needed, how to stop the cat naps and tips for encouraging good nap routines. This has been especially useful for me as my first was a terrible napper and I suspect much of that was my inexperience. We started a bedtime routine with them quite early on, around two weeks old and as I’ve been filling in the sleep diary I can really see the benefit of this as they are gradually settling easier each evening and sleeping longer overnight. Again I found some tips in book and ideas for bedtime routines that helped to remind me of some of the tricks that worked with my first. We take both boys upstairs for a bath, a baby massage, a quiet feed in a darkened room then a final kiss and cuddle before we settle them down in their cot. When they are a little older we’ll add the bedtime story in; my eldest already has several bedtime stories so I’m looking forward to snuggling up with all three of my boys before bedtime. Looking over my diary I could see that was actually getting a reasonable amount of sleep, sometimes six hours but it was split up over the night which was obviously making me feel worse. This last week we’ve really made an effort to get the daytime naps sorted, make sure the daytime feeds are good amounts and we’ve moved them to only having one feed overnight. Its amazing what a few hours of uninterrupted sleep can do for you! Let’s face it sometimes you just have a bad night and there seems no rhyme or reason but at least if I’m consistent in my sleep techniques I feel a bit more in control and hopeful that the next night will be better. Kiddicare are running a competition on their blog to win a copy of Baby Sleeping Trust Techniques and they will also be posting extracts from our sleep diaries so keep a look out over the coming months!